Ebook price above is half-off. Print price is currently 40% off. Promote Your New Book ~ OR ~ Breathe Life Back Into an Older One! Do you want to generate sales for your book, but just aren't sure what steps to take? This is for you! WHAT'S THE BIGGEST MISTAKE AUTHORS MAKE? If you really want to sell books, don't do what most authors do - dump your book at a few websites and walk away, hoping it'll catch on some day. That just doesn't happen in the real world. Don't hide your words from the world! Promote it aggressively using the easy tips and schedule provided in this book! “90+ Days of Promoting Your Book Online” is the indie-authors’ bible. Read it and reread it. - -Pamela Allegretto, Bridge of Sighs and Dreams - Nazi-occupied Rome sets the stage for Bridge of Sighs and Dreams, where the lives of two women collide in an arena of deception, greed, and sacrifice. I'm a language teacher (foreign ones that is) and I appreciate your writing in a no nonsense style...it's fun to read and it goes fast. This is fantastic. Started implementing on my website today. A BIG THANKS!!! The work is an easy read and easy to follow. Just printed a copy of your '90 Days of Promoting...' and while I haven't yet had time to read it in depth, what I saw coming off the printer looked amazing! Just in that brief scan, I saw answers to several different questions I have had recently about how to do certain things. It looks to be invaluable and it is much appreciated. 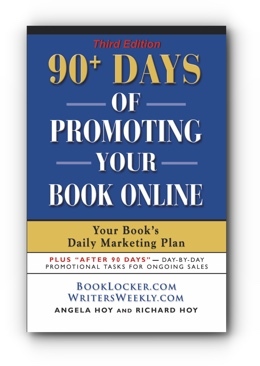 90 Days of Promoting Your Book Online is well written, easy to follow, and follows a logical progression to forming a writer friendly, workable plan. Best book on the subject I've seen yet. I wanted to thank you for the amazing book, 90 Days of Promoting Your Book Online. What a great gift to me and all of your authors! You guys and the whole crew at Booklocker are amazing and so generous with the time you spend making it all so much easier for us! All my best to you! I gave in to temptation and bought the 90 day promotion book you released. What can I say? THANKS!! It is proving to be very helpful and focused. As a BookLocker author, I have it, read it, love it and am using it. Wow! What a tremendous book. There’s a gold mine of information and how to’s in there. Your book has made (marketing) interesting and fun. I am only up to page 30 of your 90 day promotion book and I am blown away!!! Thank you so much. I had no idea!!! You have made it comprehensive and so easy to do even for a computer dummy like me. 90 Days of Promoting Your Book Online IS EXCELLENT! Just wanted to stop in and touch base. Wanted to share with you that thanks for 90+ DAYS OF PROMOTING YOUR BOOK ONLINE. I really learned so much. I still use much of what I learned two years and some months later. I feel very comfortable promoting and marketing myself. "Buried in addiction and digging in even deeper with denial Cora's life is a mess. Until one day her reality takes a turn that lands her in an unfamiliar world. With the otherworldly assistance of Sol she will begin to realize how close she has brought her soul to fading away completely. Is it too late? Or can Cora face down her demons and save her soul?" Written in plain language, 90+ DAYS OF PROMOTING YOUR BOOK ONLINE contains a wealth of valuable information for all established and new authors alike. Angela and Richard Hoy have clearly done their homework, proving their success by implementing their strategies in their successful companies. As an established indie author, I have often found the virtual world of online book promotion and social media marketing daunting and mystifying. The authors do a fine job of not only demystifying it, but detailing a step-by-step marketing plan, designed not only to communicate directly with readers, but to skyrocket sales. I plan on implementing it immediately. Thank you Angela and Richard Hoy. Well done. Your book, 90 Days, is excellent, and is at the heart of my marketing plan. It is clear, easy to read and to follow. Thank you again! Your 90+ Day Marketing plan is incredible and worth its weight in Gold - even platinum. Excellent book. Thanks for sharing it (with BookLocker authors) at no cost. Prayer is Talking to God ... MEDITATION is LISTENING! Wow! I've just read most of the 90-day plan. Now that's serious marketing! Remember Your Past, Write It, and Publish It in as little as 12 weeks! Angela Hoy is well-known in the online freelance writing community as the publisher and editor of WritersWeekly.com, a site that publishes new freelance jobs and paying markets every Wednesday. She is also an advocate for writers’ rights, publishing numerous articles on how writers can protect themselves from deadbeat editors and publishers as well as common industry scams. She created and moderates the Whispers and Warnings forum on WritersWeekly.com, where writers can share their experiences with deadbeats and scammers targeting writers. She is the author of 11 non-fiction titles and the co-author of 2 additional books. Her book, How to Be a Syndicated Newspaper Columnist, was one of the first ebooks created and sold online. Richard Hoy had been involved in Internet marketing since it became a profession back in 1995. Early in his career, he developed and executed online promotional strategies for a number of companies. He was moderator of the Online Advertising Discussion list, the first discussion community on the Internet dedicated to the subject of online advertising. Richard created and edited The ClickZ Guide to Email Marketing, one of the first compendiums on the subject of the then-emerging field of email marketing. He was a regular speaker at the popular Web Advertising and Web Marketing conference series back in the heyday of the dotcom boom; as well as a columnist on ClickZ, where he wrote a well-received column on small business use of the Internet. For the past 12 years he has focused his expertise on building the self-publishing services company BookLocker.com into a respected online brand.